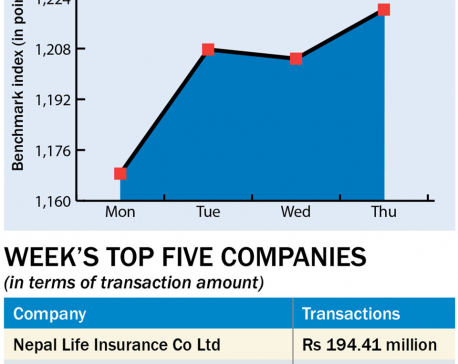 KATHMANDU, Dec 1: The benchmark equity index began the week's trading on a weak note. The first trading session of the week on Sunday saw the Nepal Stock Exchange (Nepse) index post a loss of almost 15 points. The index, which fell 6 points on Monday, retraced slightly and added over 1 point on Tuesday. Nonetheless, stocks continued to struggle in the latter sessions with Nepse index shedding 2 points and 11 points on Wednesday and Thursday. Consequently, the index posted a weekly loss of 32.88 points or 2.78 percent to settle at 1,148.36 points. Stocks continued to post weekly losses as the market has failed to take a breather from the continuous slump seen in the past few weeks. As a result, Nepse has dropped around 100 points in just over a month and is now trending at its lowest level since early 2016. The overall investor sentiment has remained fairly bearish backed by interest rate worries in the financial system of late. However, investors also have a close eye on pending dividend announcements by most of the listed companies which might also have an effect in the equity market. 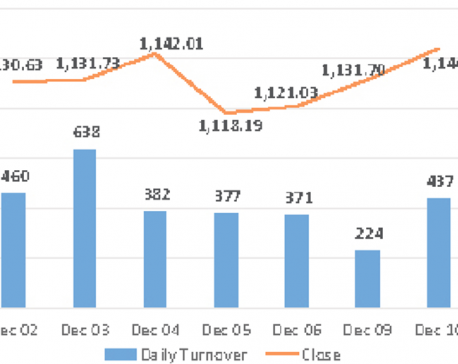 Market activity, in the review period, saw some improvement as the bourse posted a total turnover of Rs 1,519 million against Rs 1,245 million in the preceding week. Sensitive Index, gauging the performance of Class 'A' stocks, mirrored the broader market and fell 2.75 percent. Weak sectoral performances dominated the week's trading. Non-Life Insurance scrips were the biggest drag as the group's sub-index tanked 6.40 percent. Microfinance sub-index also struggled and closed 5.85 percent lower followed by Life Insurance sub-index which shed 3.38 percent. Sub-index of heavyweight banking scrips fell 2.52 percent, while that of Hotels segment sank 2.45 percent. Similarly, all other sub-indices closed significantly lower in the week. On the announcement front, two commercial banks declared dividends in the week from their respective net profits of Fiscal Year 17/18. Sunrise Bank Ltd and Nepal Bangladesh Bank Ltd have proposed 11.5 percent and 10.53 percent cash dividend, respectively. The dividends are yet to be approved by their corresponding annual general meetings (AGMs). Similarly, Nadep Laghubitta Bittiya Sanstha Ltd has announced 30 percent bonus shares, while Deprosc Laghubitta Bittiya Sanstha Ltd declared 20 percent dividend including 10 percent stock dividend and 10 percent cash payout. In other news, swap ratio for the impending acquisition of Om Development Bank Ltd by Prime Commercial Bank Ltd has been confirmed as 100:80 following the approval from Nepal Rastra Bank (NRB). After the acquisition, the paid up capital of Prime Commercial Bank Ltd will reach Rs 9.5 billion. As per the ARKS technical analysis, the index formed a bearish marubozu candlestick on the weekly timeframe indicating sustained selling pressure in the week. Weekly Relative Strength Index (RSI) has tilted close to the oversold zone, while the Moving Average Convergence Divergence (MACD) is on the verge of forming a dead cross. Both indicators, hence, suggest further downtrend likely for the near term.